Harry Merchant was detained after being accused of carrying out an attack on a man on Aberdeen’s Provost Rust Drive on August 27 this year. After being denied bail he found himself in the same prison as a man whose conviction he once helped secure as a crown witness. During an appearance at Aberdeen Sheriff Court yesterday, the 38-year-old claimed he was too fearful for his safety to leave his cell for any more than ten minutes each day. Merchant was remanded in custody once more after he confessed to assault alongside co-accused Victoria Smith, 36. The court heard they had approached a man at a bus stop on Provost Rust Drive and punched him. Their victim is said to have covered his head with an item of clothing but then felt a sharp object strike him above his left eye. Police officers were on patrol nearby and stepped-in to break up the assault, recovering a screwdriver from the scene. Representing Merchant, defence agent Kevin Longino told the court about his client’s apparently dire situation in prison. He said: “He is in solitary confinement in HMP Grampian and only let out for ten minutes per day. He added that this had had a detrimental effect on his client. 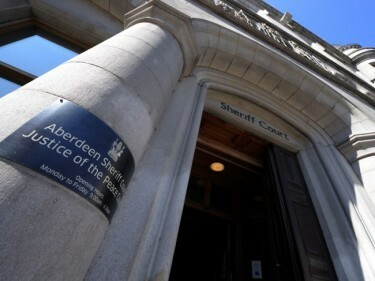 Merchant and Smith, of Newton Road in Aberdeen, will return to court next month. A spokeswoman for the Scottish Prison Service said: “We do not comment on individuals. “Her Majesty’s Prison and Young Offenders’ Institute Grampian provides opportunities for non-offence protection prisoners to access education and training should they wish to attend. “Where possible, staff from the learning centre also attend the halls to provide learning opportunities.